Bobcats' 74-game home winning streak comes to a close. RICHMOND — Sacopee Valley has been part of heartbreaking losses at the hands of the Richmond High School softball team in the past. Just two years ago, the Hawks watched the Bobcats celebrate a walk-off 4-3 come-from-behind win in eight innings, the closest home contest for Richmond in several seasons. On their home field, the Bobcats have been unstoppable. In fact, coming into Monday’s matchup with the Class C Hawks, Richmond hadn’t lost at home since May 19, 2009 (a 4-3 setback to Buckfield), a span of 74 games. Times Record photo by Bob Conn Sacopee Valley baserunner Lakyn Hink dives into second base ahead of a tag from Richmond shortstop Caitlin Kendrick, left, on Monday. Hink later scored the game's first run in Sacopee's 2-0 victory. Times Record photo by Bob Conn Richmond's Ashley Brown catches a fly ball off the bat of Sacopee Valley's Breanna Humphrey on Monday in Richmond. 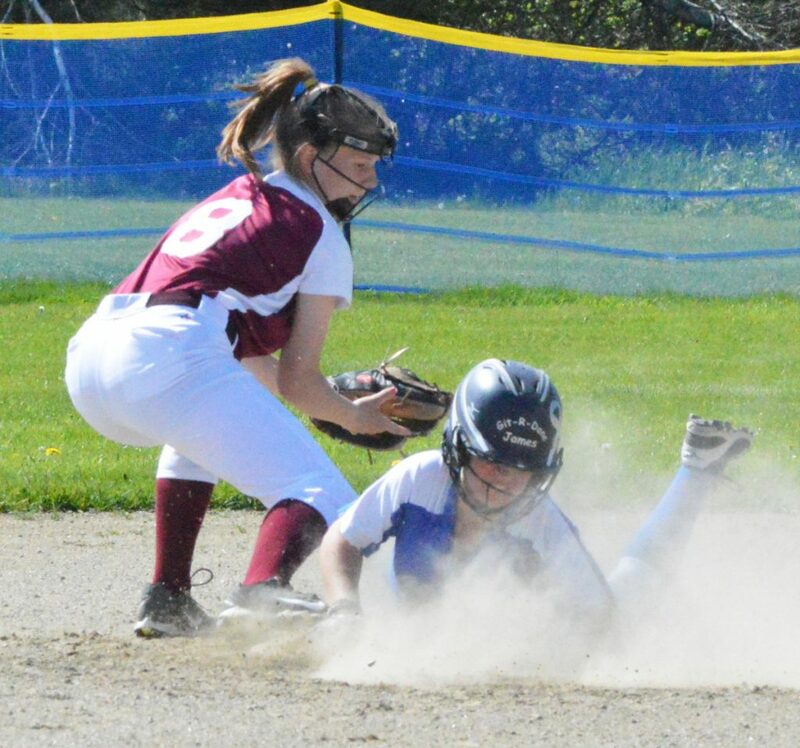 This year was different, as Sacopee Valley rode the solid pitching of senior Brynn Hink and error-free defense for a 2-0 win, giving the Hawks an 11-1 mark while dropping the Bobcats to 10-1. “This is pretty big for us and shows how our team sticks together in big situations,” said Hink, who allowed the Bobcats just three hits and two walks. She struck out four and retired 18 of the final 20 Richmond hitters. 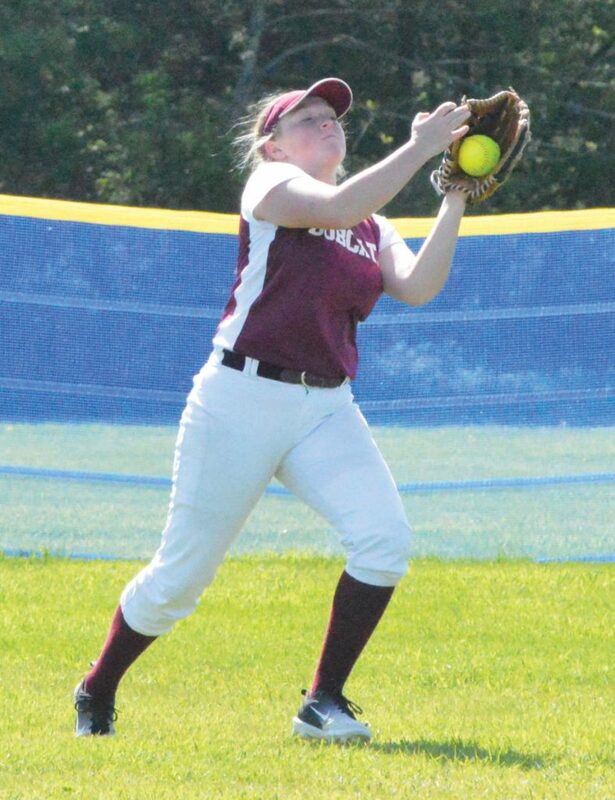 Sacopee Valley jumped out to a 1-0 lead when freshman Lakyn Hink doubled to right field, moved to third on a wild pitch and trotted home on a two-out single by Grace Sanborn. Brynn Link retired the first two Bobcats, then worked around a single by Sydney Underhill-Tilton and a walk to Bryannah Shea for a scoreless first frame. Haley Chapman singled for Richmond in the second and moved to second on a sacrifice bunt by Breanna Vintinner. Again, the Sacopee Valley right-handed hurler escaped unscathed. On the hill for Richmond was Underhill-Tilton, who used her riseball to keep the Hawks off-balance. She struck out nine and did not walk a batter. The Hawks had their chances. Bailey Smith and Riley Vacchiano each singled in the second, and back-to-back singles in the sixth by Haiden Sawyer and Breanna Humphrey put two runners on base with one out. However, Underhill-Tilton managed to pick up a key strikeout when she needed one. “Syd did a good job on the mound keeping us in it,” said Martin. Sacopee Valley doubled its lead in the fifth. Smith reached on an error and stole second. Consecutive bunts by Gabby Martin and Lakyn Hink (2-for-4) loaded the bases, and a fielder’s choice ground ball by Issie Eldridge plated Smith. But the story was Brynn Hink. After Chapman’s single in the second, the righty retired eight in a row before a fourth-inning single by Chapman (2-for-3) ended the run. The only other baserunner for the Bobcats came in the sixth when Shea walked for the second time. She retired the Bobcats 1-2-3 in the seventh on three straight ground balls. “Facing this team at the end of the season is what you want, and tomorrow we face Buckfield (4 p.m.), which gets us ready for that one,” said Martin.